Okay, I've been keeping up the good habit of posting now for almost a week... or at least from one week to another. It's day 18 of the California Countdown and boy was it a long one. I've been working on selling prints of selected work from my portfolio, in an attempt to curb my enthusiasm of finding employment during the first semester at CCA. Mainly in part and thanks to the kind folks at the Weav. for their support of the arts, I'm getting closer to that goal as each day passes. On another note I just finished reading an article in the LA Times about the directorial change on Pixar's upcoming film The Good Dinosaur', from Bob Peterson (co-director on UP) to Pete Sohn (director of the short Partly Cloudy). One year from today on November 25, 2015 the screen will shine with what I believe will be another hit for the studio. 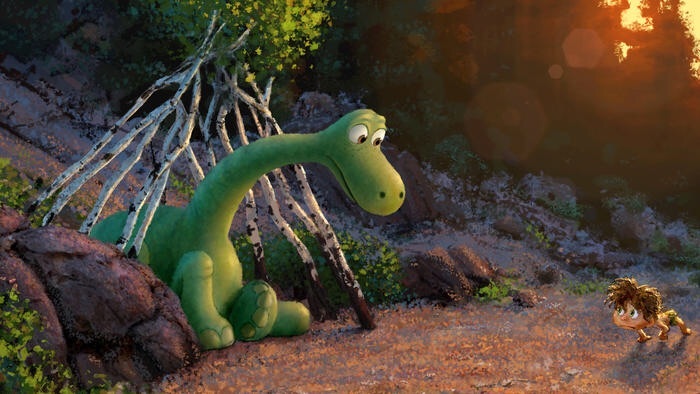 The Good Dinosaur' is a animated comedy film that imagines the moment when dinosaurs met human beings. While dinosaurs are known to have gone extinct, the tale illustrates how the creatures evolved into farmers instead, using their figures to dig trenches and slice tree branches. When I was at CalArts in 2011, I reached out to Pete about his student animated shorts. Following the advice of Brad Bird "start at the top and see if they respond" worked out to be true. His response pictured below couldn't be more removed from the truth. I was able to find one of his shorts Rain. Even though the second half of the short is just storyboards of his ideas, the first minute is quite imaginative. I'm so happy that he's been given another opportunity to showcase his own narrative, this time on a feature film. Here's a link to the article for your reading pleasure.